The Envelope modules are normaly used in combination with the filters VCF1 and VCF2 to Timbre shape the sound and the VCA module to Amplitude shape the sound. The output envelope curve is however sent to the modulation bus, this enables you to use the Envelope curve on any module that has an modulation section. At this section you select the gate signal that determines wheter the envelope is in its Attack, Decay or Sustain phase (gate on) or in it's Release phase (gate off). KEY The gate signal is comming from the keyboard or your VST Host program. CV1, CV2 The gate signal is comming from the CV1 or CV2 strip of the SEQUENCER module. GATE1,GATE2 The signal is comming from the GATE1 or GATE2 strips of the SEQUENCER module. You can select different curves for each A,D or R section of the envelope. Linear With this curve, the growth of the signal is linear whith time. At 50% of the Attack time the signal wil be at 50% of it's maximum. Curve1+ This curve is more or less exponetial. 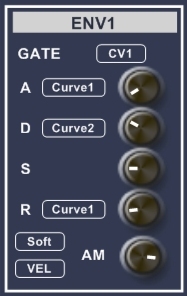 It is specialy designed to reflect original analog synth envelope curves. At 20% of the Attack time the signal is at 50%. If you use this curve for the Decay and Release sections, the effect wil be reversed e.g. at 20% of the Release time the signal wil be reduced by 50%. Curve1- This curve is the inverse of Curve1+ e.g. at 80% of the Attack time the signal wil be at 50%. New curves may appear in later versions of the software. The Amplitude modulation section is a special feature of the HV-Formant. It enables you to manipulate the envelope curve before using it at an other module. For instance if you want to create a special trance-gate effect you can make a pattern at the GATE1 strip of the sequencer and select this at the AM terminal. The knob determines the depth of the effect. To hear the difference you can also try to select GATE1 at the GATE section of the envelope module or select GATE1 at the TM terminal of the VCF module or the AM terminal at the VCA module. The Midi velocity comming from your keyboard or host program (VEL at the modulation terminals) is a verry important play parameter. Special care is taken to optimize this signal at the envelope modules because this is the place to implement these play dynamics. Experiment with VEL at the AM input terminal and play with the Linear, Hard and Soft AM modes. TIP!Midi keyboards have different velocity responces experiment with your keyboard velocity settings and the VEL. settings at the CONTROLLER module. The envelope module produces 2 outputs, that are routed to the modulation terminals (See:Input terminals). ENVn+ This is the normal output signal and runs from 0 to 1. ENVn- is 1 minus the standard output it runs from 1 to 0. If you want to have the inverse signal, 0 to -1 or -1 to 0 you can select Inv at the target module modulation section if available or use a MIX module to invert the signal.